Note: Today, Charles Schwab Corporation rolled out a new automated investment service, designed to directly compete with my company, Wealthfront. This post is intended as a personal reflection, as the CEO of a new company, on what can lead a great company so far astray from its founding values. When you grow up in Silicon Valley, you grow up with stories about legendary entrepreneurs, the businesses they built and the industries they changed. Chuck Schwab is an icon for founding a firm that would be different than Wall Street. Different from its arch-enemy, Merrill Lynch. A firm that would be focused on the client and look out for the little guy. When I joined Wealthfront, I held up Charles Schwab as an example of a different type of company, a company with values to which we might aspire. Not only was this the type of company I would have wanted to work for, but it was also the type of company whose service I would have wanted to use. It stood for the right things. You can understand why it’s disheartening to see those values broken. That Charles Schwab is gone. The much heralded launch of Schwab Intelligent Portfolios, backed with a multi-million dollar marketing budget, promises to bring an automated investment service similar to what Wealthfront provided in 2012 to its clients at the startling price of… nothing. Each investment strategy involves the Sweep Allocation to the Sweep Program. The Sweep Allocation will generally range from 6% to 30% of an account’s value to be held in cash, depending on the investment strategy the client selects based on the client’s risk tolerance and time horizon. The Sweep Program is a feature of the Program that clients cannot eliminate. The deposit balances at Schwab Bank will not be used to purchase securities for a client’s account unless those balances exceed the Sweep Allocation for the selected investment strategy. To find the answer, Follow the money. You might not know this, but Charles Schwab no longer makes most of its money from trading or commissions. In fact, it generates over $1.7 billion per year from net interest revenue, almost 3x what it makes on trading commissions. 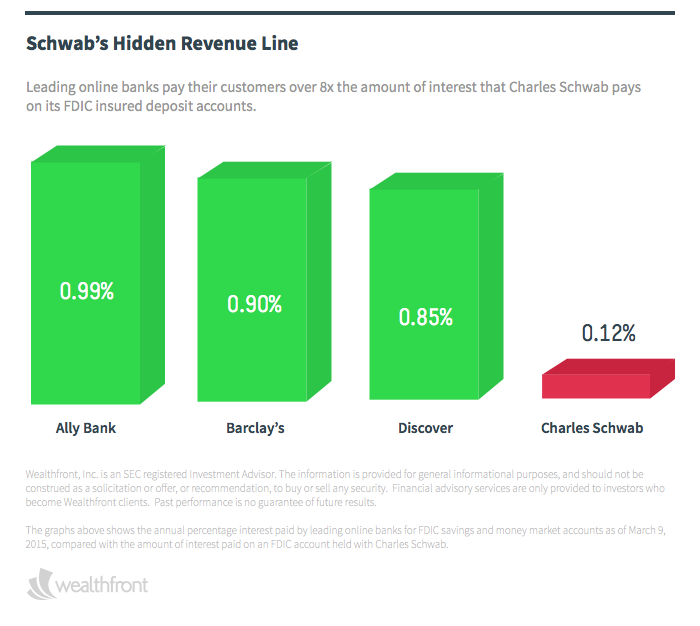 Leading online banks pay their customers over 8x the amount of interest that Charles Schwab pays on its FDIC insured deposit accounts. 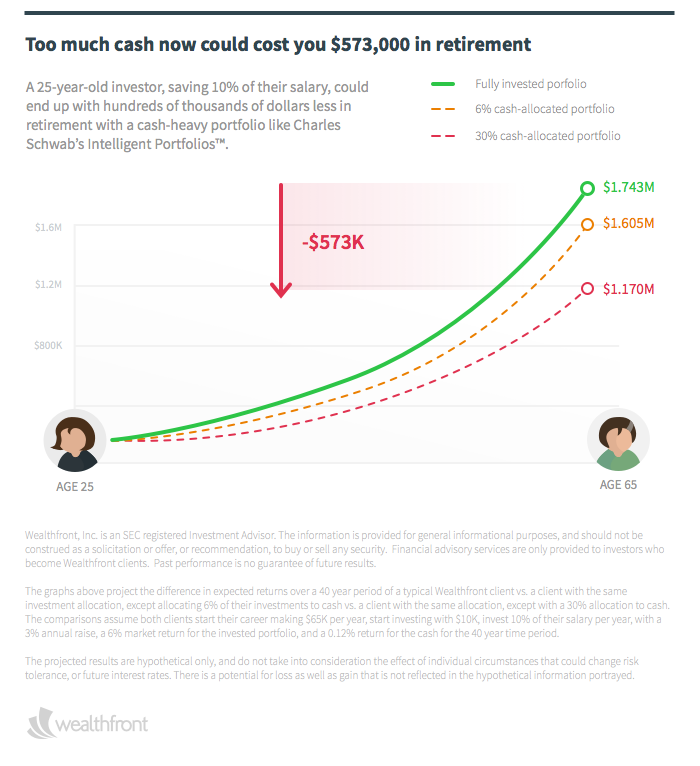 A 25-year old investor who is just starting out, making $65,000 per year and saving 10% annually, could end up with over $138,000 less in retirement due to having a 6% cash allocation in Schwab’s Intelligent Portfolios. At 30%, it’s almost criminal. The same 25-year old might be deprived of over $573,000 when she retires at 65. Smart Beta? Smart for the Bottom Line. Buried in Schwab’s Intelligent Portfolio FAQ, the company reveals its selection of asset classes. Besides the self-motivated cash allocation, Schwab allocates a large portion of your account to “smart beta” ETFs. The real issue, of course, is fees. The average smart beta ETF that Schwab has selected not only has 3x the management fees of the average Vanguard ETF, but not surprisingly all are either proprietary Schwab ETF products or ETFs from issuers that pay Schwab to use them. Smart beta is stupid; there’s no such thing. It’s an idiotic phrase. Quoting Shakespeare, I guess: It’s a tale told by an idiot, full of sound and fury, signifying nothing. 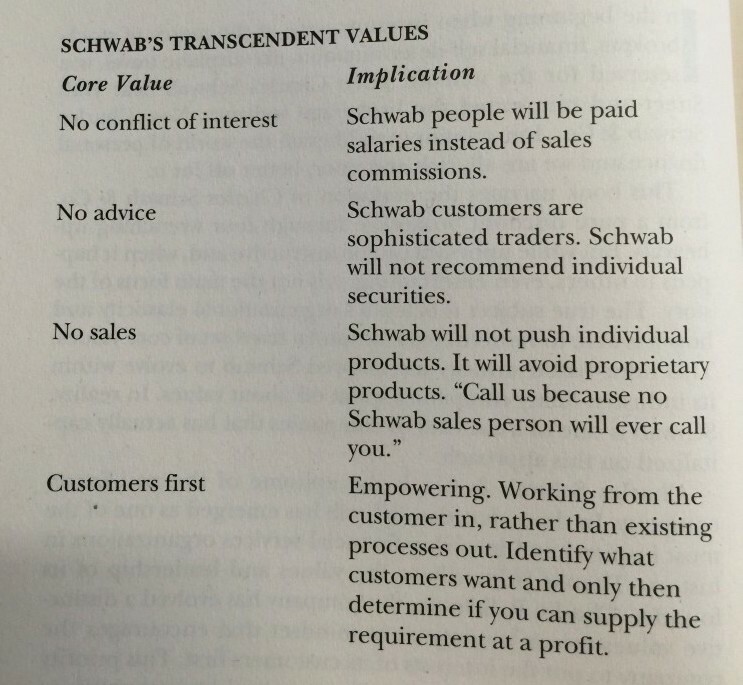 Charles Schwab is not stupid. There is no question why it decided to create entirely new asset classes for smart beta in its allocations. All you have to do is follow the money. For a young investor, Schwab’s greed is expensive. Too expensive. And it doesn’t have to be this way. Vanguard doesn’t play the game of marketing kickbacks, hidden fees and misleading pricing. Vanguard has grown to over $3 trillion in client assets without playing these tricks. That’s the kind of company we at Wealthfront aspire to be. Charles Schwab documents over 14 pages of fees on its website. And as a sweet farewell, if you actually decide to move your account to another brokerage firm, it will take another $50 on the way out. Young investors are tired of this “gotcha”-based pricing. Charles Schwab initially set out to be different than Merrill Lynch. But today, Charles Schwab has become Merrill Lynch. And despite being 3,000 miles away, Wall Street has seeped into every fiber of the company. In December, Wealthfront dedicated a 14-foot wall to the Wealthfront manifesto. Why? It’s simple. Our clients are our one true north. They are our focus, our passion and our purpose. Much to my dismay, I now find myself hoping we never lose our identity the way Charles Schwab has. It’s my hope that we always place our clients first and show them the transparency they deserve. But if firms like Vanguard can retain their integrity over decades, we know we can too. Selling out isn’t the only option on the table. It is my sincerest hope that they will address the above issues, modify their new service and put their clients’ interests first. At least, that’s what the company I used to look up to would do. Wealthfront, Inc. is an SEC registered Investment Advisor. The information in this article is provided for general informational purposes, and should not be construed as a solicitation or offer, or recommendation, to buy or sell any security. Financial advisory services are only provided to investors who become Wealthfront clients. Past performance is no guarantee of future results. The projected results included above are hypothetical only, and do not take into consideration the effect of individual circumstances that could change risk tolerance, or future interest rates. There is a potential for loss as well as gain that is not reflected in the information portrayed. Actual investors on Wealthfront may experience different results from those shown.